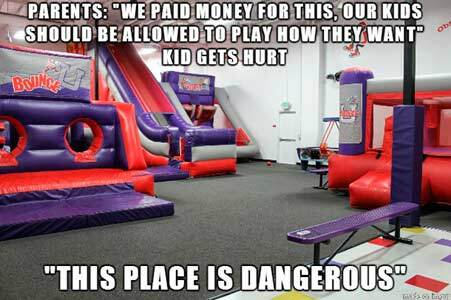 “Water slides vs Bounce house Memes & images"
For does older folks that don’t know what a meme is let me explain. Most memes are captioned images that are intended to be funny. With memes, we get to make fun of social behavior that just happens. The word meme is pretty new, Richard Dawkins a biologist first used it in 1976. The word comes from the Greek’s meaning something imitated. In our fast pace era with the internet, we get to pass imitated social behavior thru memes. So let me not continue to bore you with more boring history and let’s get to the fun part. 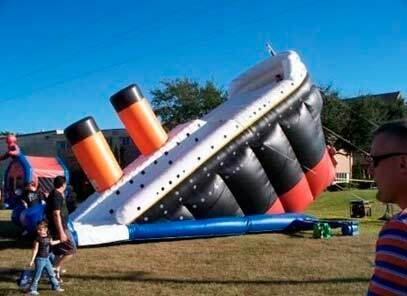 This one shows how we can still laugh about an old tragedy, the Titanic as an inflatable water slide. I guess is a way of not taking life too serious. See it this way we all pass away and sometimes it’s better to laugh about things. I don’t think so, $500k when I’m dead won’t work for me. What about you would you risk it? There’s a chance they might not be hungry and you get to swim out with $500,000. 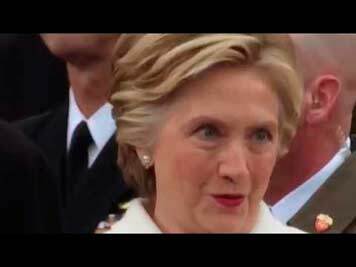 I haven’t seen a scary face like this since Hilary lost the election. 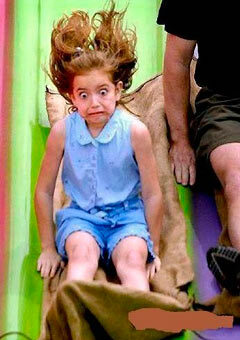 It goes to show you that not everyone is photogenic going down a slide. Hopefully, she got over it and went on the ride over and over. You guys remember the Soup Nazi from the Seinfeld show. Well, he is back as a water slide Nazi. Behave or there won’t be, no slide for you! 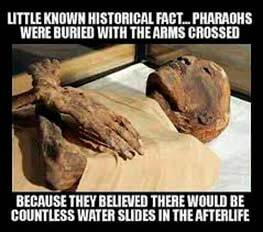 Yes in Egypt pharaohs loved water slides too. See everyone loves water slides, now rent one from us! Water Slides | Bounce House time let see who wins! 1. What you talking about rent your bouncer with us. Take a look at this adorable kid and tell me you didn’t just fall in love? 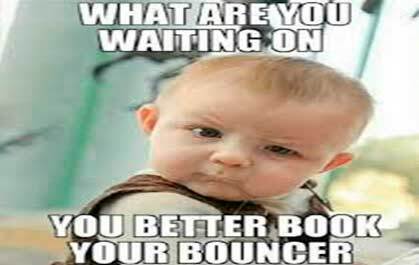 I know we did so book your Bounce house today. 2. Can you tell the difference between the inflatable and wood one, which would you choose? I know I would bounce all day! 3. Sometimes parents will say to us, “we paid you to bring the bounce house don’t worry about how we will use it”. After kids get hurt you know how it goes. 4. I don’t think they thought about this when they order the Spiderman bounce house inflatable. 5. 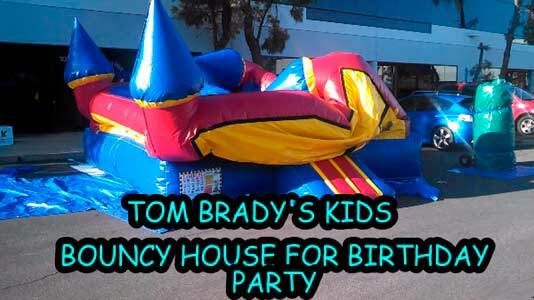 If Tom Brady was a party rentals this is what you would get lol, go dolphins! Which was your favorite, let us know in our Facebook page or leave a comment right here. We also would like to thank all does guys that put an effort to making us laugh. The Verdict on Water Slides! The water slides units have become the focus of attraction for kids and adults. They are absolutely fascinated and delighted by these water attraction. They simply love to slide and play on them. The attraction is more if these water-slides are interesting. Also, there is some caution too as the slides are not for all types of children. Also, you must buy the items from reputed and big businesses. Which take care of kids' safety, while playing by preparing them with comfortable material. The most vital thing when leasing these is grown-up supervision. Many people don't understand that you shouldn't go down a slide some other way yet feet first. The other thing is all slides have tallness and weight confinements. Additionally, never slide down with 2 individuals in the meantime, particularly never a grown-up with a kid. Once the children host touched base at the get-together, train them to remove their shoes, again reminding them to eliminate all gems or anything with a zipper. You don’t want the need to be in charge of any gaps that should be repaired in the inflatable. In fact, businesses offer great packages for their clients and have so many gear items. 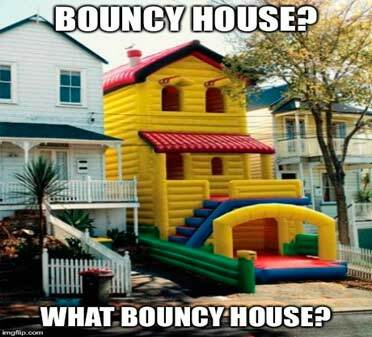 Usually, you can rent particular things, for instance, a bounce house. Sometimes they offer special combo units which combination of things. Example, dance floors, inflatable houses, general item, and etc. Also, the added objects you lease or buy, the less money you pay for the items by itself. Its smart way that you check the way of the things they offer are in great care. Taking a quick initiative to speak with their owner or team and make request identifying the safety of their things. Water slide rentals are a fun approach to give your child a treat for the late spring or summer. Get ready for a children birthday gathering is not a simple assignment. You have to make a great deal of arrangements, from the party theme and fun stuff for the children. A few people attempt to be unconstrained and quite recently given things a chance to happen normally. For this reason, some fair better than others but this can lead to an assortment of problems which may ruin your child special day. When you're looking for the best inflatable water slides, the main qualification that you'll have to make is whether you're searching for a private inflatable or a business inflatable. Here's the essential contrast between the two items. 1. Private inflatable water slides are for the most part planned to be utilized by kids less than 12 years old. They might be single individual inflatables that for the most part have a weight resilience of 120 pounds or less. 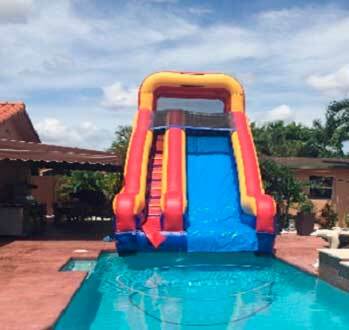 2. Business inflatable water slide are appropriate to be utilized by youngsters and grown-ups. They are intended to be as often as possible utilized, even once a day, by a few people without a moment's delay. Private water slides are lightweight and simple to setup or bring down. A few makes and models in this class may express that they can hold up to 5 youngsters at once. This implies that their weight resilience would be 500 pounds or less. The weight of the inflatable is frequently 50 pounds or less, which makes it workable for one individual to set up the water slide all alone. Most private water slides will work with a standard garden hose with good water pressure. 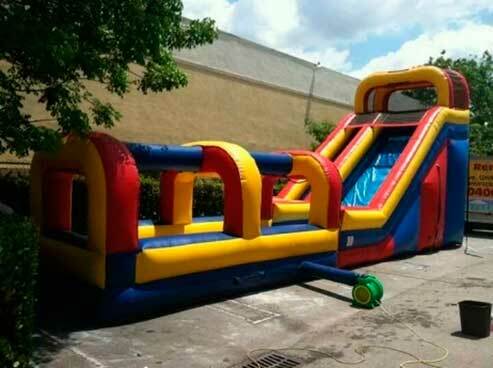 Business water slides can serve as a nonexclusive inflatable slide also which means for rental or sales purposes. These are typically obtained by rental organizations or associations which have vast events since they may cost a few thousand dollars. They can hold a few grown-ups on the double and may have various slides incorporated with the plan. Most will in any case work with a standard garden hose but again with good pressure. Many have a tendency to have a mass of more than 160 pounds when completely compacted, so 2-3 individuals might be expected to set them up. Sometimes renting and not buying a business type of waterslide is a better choice. There are sure advantages to owning every sort of inflatable water slide, so everything relies on upon how you plan to utilize your favorite one. In the event that you have ever leased an inflatable bounce house or water slide, then you were utilizing a business inflatable. Additionally, a steady stream of water is required if utilizing either item as a water slide. Also, having incomplete water pressure can prompt to skin rubbing wounds that are like cover burns. Both sorts of inflatable water slides will commonly accompany a persistent air blower so that the unit can be utilized securely. Admittedly, a hefty portion of the blowers which accompany this sort of item required a 220/240 outlet to be appropriately utilized. This implies you may have to rent or buy a generator that can supply the appropriate measure of force. 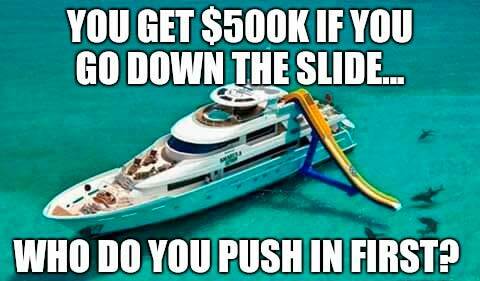 Both are great and it depends on your needs on the day you are going to use the inflatable waterslides. Buying or leasing shouldn’t be problem. Mostly because either can be used for small or big event. Better to have more choices than just having one. 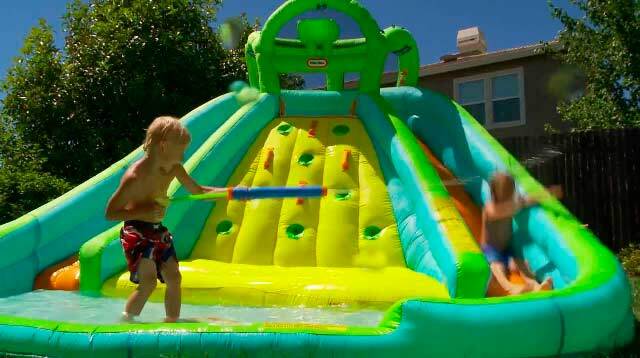 Water slides rentals are a great idea for these hot summer days. But with also have to prepare when renting a water slide. Let's start with the before renting tips and then we go with the safety tips. Do you have enough space for these type of inflatables? Yes, the worst thing that can happen is that your backyard is too small for water slides. Here at Party rental Miami Nicky, we ask you these question before you order to make sure you don't experience this problem. Some inexperience rental companies might fumble with advice so be prepared. I can't stress this enough please make sure you deal with an experienced company with good reviews overall. You should try to aim for at least 4 to a 5-star rating on google reviews. When you call make sure you get everything verified thru an email. If a company doesn't have insurance then you can be liable for any injuries that might happen on your property. If the company can't provide insurance you might want to look elsewhere. Besides if you are doing the party at a park most parks require insurance. Water slides are a top item for getting kid's parties going. But we can't leave out injuries that can happen if not prepared. Take a look at this image a lot of things are off here, like no supervision too many kids sliding at the same time and not waiting for landing area to be clear. Let's go over some important tips right now. 1- Always have one grown up paying attention to the inflatables at all times. 2- Slider shouldn't be used as a bounce house, which means no jumping on the slide. 3- Don't let anyone backflip or jump off the slide on their way down. 4- Do not allow head first sliding, this can cause serious injuries. 5- Kids should be in line to use slide one at a time. 6- Landing area should be clear before the next slider goes. 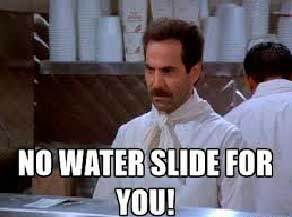 7- If too windy or heavy rain the slide should not be in use. 8- Check for sharp toys or objects before kids get on, this can cause serious injuries. By following these tips you will make sure to have a great party experience with family and friends.